The most enjoyable and cooling time to kayak is at night but the question is can you actually kayak at night? 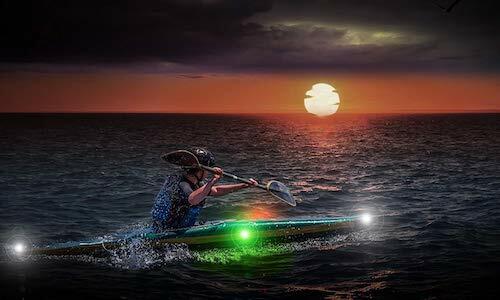 Kayaking during nightfall is of course, adventurous and fun but we need to keep a few things in mind to ensure our safety. Below are some tips that will help all of us kayak at night smoothly. We should always make ourselves visible at night because at times as it could be very dangerous. We should always have a green night kayaking lights in the right-hand side of the kayak and a red kayak night lights on the left hand side of the kayak to make sure others know we are there and in which direction we are moving. We always need to be aware of our surroundings when we are kayaking at night because that will help us from not getting rowed over by big objects or other unexpected things. We need to make use of our kayak headlight to check the surroundings. We also need to keep in mind that the ambient lighting of the nightfall will make things actually look further away than they actually are. Before going out for this adventure, we should always decide our route plan ahead. Otherwise there is a high probability of us getting lost in the water at night. If we were to kayak at night, we won't be able to see the paddle easily and this will make the journey harder. If there were to be waves, it will definitely make things more complicated. We should always be prepared for our safety by getting ready the essential safety gears because kayaking at night is not safe. We need to carry our dry bag which will contain our ID, dry clothes, and first aid kit. If you are a female, this article is for you. We also need to carry a whistle to indicate to people around us of our presence. If not, we may end up crashing to others, resulting in a devastating situation. Kayaking in the daytime is very different from kayaking at night. Due to lower vision, we need to be extra prepared when kayaking at night. Just follow all the tips above and we will be ready to have a great kayaking experience at night that will go safely and smoothly. My brother’s new hobby is kayaking and he wanted to kayak all day this weekend. It was explained here that when planning to kayak at night, he should be seen and aware of his surroundings. Moreover, it’s advisable to go to trusted shops when planning to purchase a kayak. I really appreciate your tip to try and track your route before it gets too dark! My wife and I have been thinking of taking a trip to a river for our anniversary, and we want to make sure that we have a safe trip. I will be sure to tell my wife that we should try and plan our route ahead of time if we plan to go!